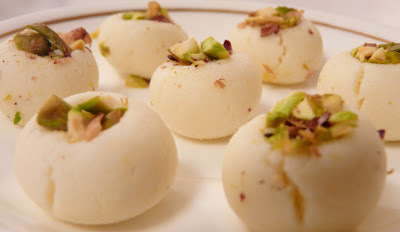 It is a mouthwatering dessert originated and still very popular in Bengal region.It is created with milk and sugar. It’s simply a white cloud of heaven, which melts in your mouth. Boil 1/2 milk in a pan & add citric solution into the boiling milk. Once Chenna (curdled milk) settles,sieve through muslin cloth,rinse under cold water & squeeze well. try to make a ball out of that dough to check the dough. Add the sugar & cardamom powder into paneer & knead it again until sugar is mixed well. Now divide the paneer into 12 equal parts & make round balls.press the balls little bit from the top. Mix the saffron thread into 1/2 tbsp warm milk. Now drop the saffron mix into the press portion of the ball & garnish with pistachios. Refrigerate them for few hours before serving. Cooking the Paneer on low heat is most important step to this dish,this helps totake out the rawness. Don’t overcook the paneer otherwise it will become crumbly. Pineapple,almonds ,cherries or any other fruitt or dryfruits can be used for garnishing. It can be refrigerated for 1 week so u can prepare in advance for any occasion.